Dranjer sump cover and floor drains provide a one valve for water to pass through. This will inhibit foul odors from rising out of the sump or floor drain. 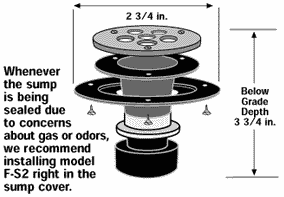 If a radon mitigation system is installed these Dranjers will stop air from drawing down through the sump cover. This is important to increase the radon system's pressure under the floor and to stop treated air from the house being drawn out which can greatly increase energy consumption. The J-S15 Sump Valve is designed to fit into and become part of your sump cover. It is a one way valve that allows water to flow into the sump but prevents Radon Gas, soil gas, insects and odors from entering your living environment. Installing the JS15 requires cutting a 2-inch hole in your sump cover. The JS15 sump valve then bolts to the underside of the sump cover using the alignment collar which protrudes around the top of the JS15. Better drain for the sump cover. 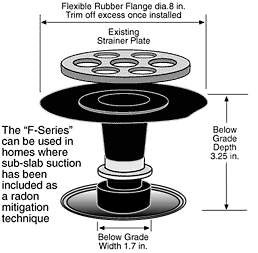 Has a brass ring that will create a stronger seal if the radon system is installed in the sump cover. Mounts below the cover. A 2 3/4" hole is required. Often floor drains are installed to drain directly to the soil. The Dranjer F-R2 creates a trap in non-trapped drains. 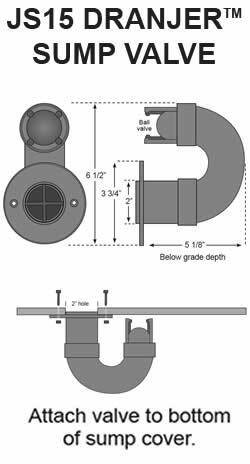 For new construction or slips into 2" PVC pipe.